UPDATE: I played around with this recipe with a few suggestions from readers and perfected the recipe. I switched the Whey protein for peanut butter powder and adjusted the amount of Swerve I used so if you have made this recipe before make sure to check out the new changes. When someone told me about Swerve I was skeptical as I have tried so may sugar substitutes that left a funny aftertaste in my mouth. Not to mention the extra junk they had in it. Then a friend served me a slice of her cheesecake and told me, you will never believe this has no sugar in it. I said “You have to be kidding me?” She said yep it’s made with Swerve. I quickly went home and contacted the company, asked a few questions and they said they would send me a few bags to try, so I decided it was time to make my first low carb/ Keto dessert. 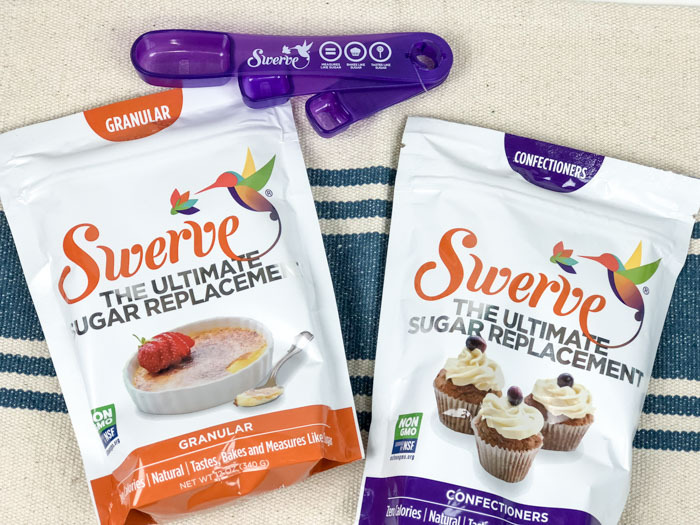 I decided to try cooking with Swerve on something pretty easy- to me the first thing that comes to mind when I think of an easy dessert is something no bake! 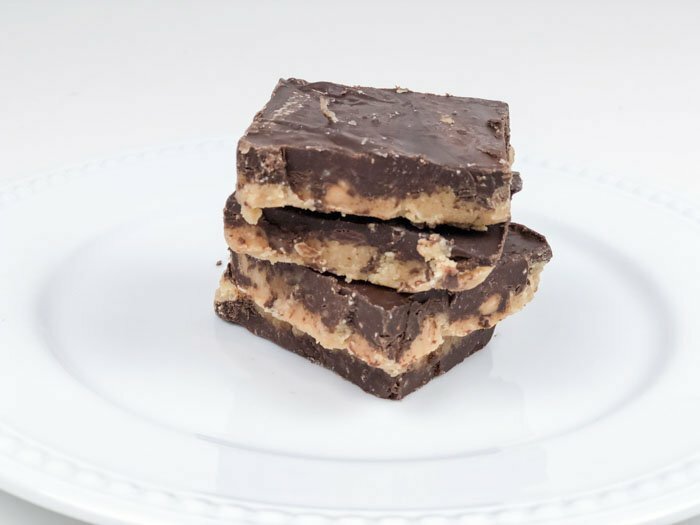 Peanut butter and chocolate are two of my favorite flavors, so this Chocolate Peanut Butter Bark was what I landed on. You can find Swerve Sugar Replacement here. This is a pantry essential if you’re on a sugar free, Keto, or low carb eating plan. You first mix the peanut butter and butter in a medium bowl, and then gently combine with the Serve confectioners sugar replacement and whey protein powder. Don’t skip out on the whey protein, as this provides a lot of the dry ingredient mixture and your bark will not set up quite as well without it. I chose the vanilla, since it naturally blends in without adding flavor when baking. As you can see, I lined my dish with parchment. 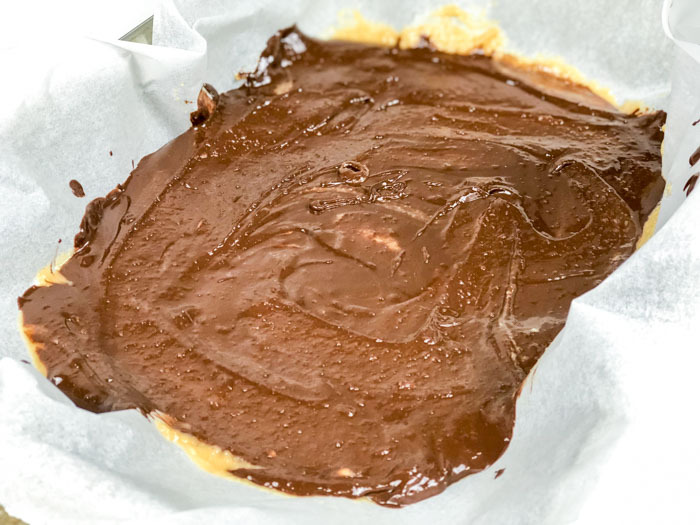 This will make it easier later to get the dessert out of the pan and cut the cold Peanut Butter Bark into even squares, without the edges getting messed up. Next, you’re ready for your chocolate topping. I popped the first layer in the fridge to set while I worked on the chocolate. For this recipe, you will need Lily’s Baking Chips. Melt these in the double broiler just like chocolate chips. After the chocolate mixture is fully melted and mixed, spread evenly over the peanut butter layer. After the layers are assembled, let it cool on the counter until the initial heat is gone (I try not to put very hot food in the fridge). Then, cover and let refrigerate for 1-2 hours. Remove from the pan using the parchment, and cut after they are thoroughly chilled. I’ve played around with this recipe and I tried substituting the whey protein for almond flour and it just didn’t give the same flavor that everyone raved about. If you don’t have the Swerve confectioners powder you can use the granules. I accidentally made the recipe with it once and some people like it better as it gave a more sugary texture and some people liked using the confectioners powder which I prefer. I also found that the natural peanut butter that you have to stir didn’t have the same consistency when I made it. See Your Recipe Here, and Enjoy! 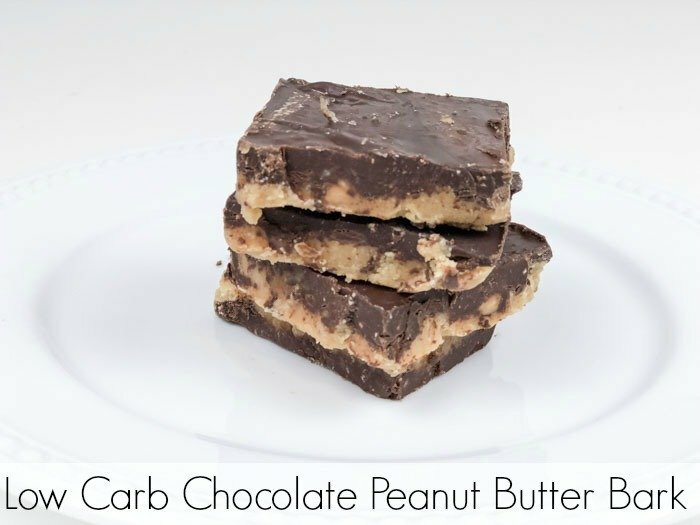 I was so excited to share this recipe for Low Carb Chocolate Peanut Butter Bark, since it has been a life-saver for my sugar cravings! Combine ingredients for peanut butter layer in bowl. Mix well. 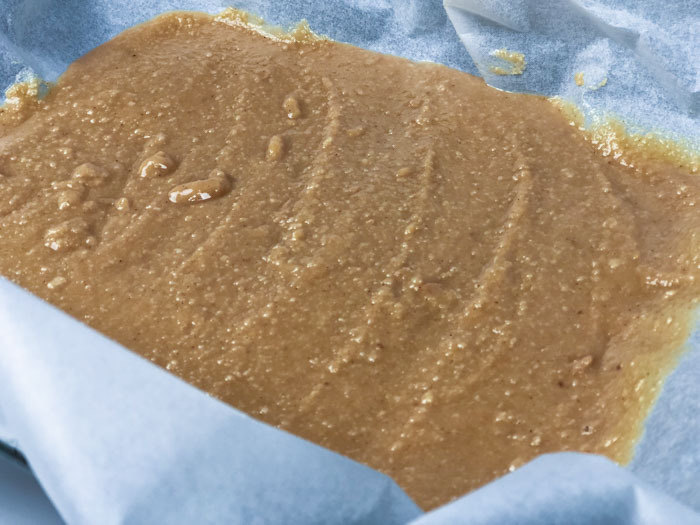 layer a 9x13 pan with parchment paper and pour in your peanut butter mixture and spread out with a spatula. Fill pot with about 2 inches of water, and bring to a boil. Remove from heat and set a stainless steel or glass bowl on top filled with the ingredients for your chocolate topping and let it melt completely. Stir often so the chocolate doesn't melt. Pour chocolate topping over peanut butter mixture and spread evenly. Refrigerate for at least an hour or two until the bark has hardened.